Internet Archaeol. 25. Williams. Introduction. Ancient Merv, in modern day Turkmenistan, is one of the most complex and well-preserved urban centres on the Silk Roads of Central Asia, straddling one of the main branches that connected Europe and Africa to the Far East (Fig. 1). Figure 1: Top map: c. 2nd century BC to 3rd century AD, Middle map: c. 5th to 8th century AD, Bottom map: c. 13th/14th century AD. Chinese texts suggest that the main route passed along the southern edge of the Taklamakan to the Pamirs, where it passed though the 'hanging passages' in the region of Gilgit and on to the Indus. It is likely that there was some traffic along the north side of the Taklamakan Desert fairly early on (but not shown here). There was also traffic from the West into Central Asia, through Merv, Balkh, etc.. Some probably travelled on the northern route via Afrisab (modern day Samarkand), while others passed through the Alay Valley and then eastward. The main emphasis by this time has shifted to the north. The axis through Merv, Bukhara, Samarkand, etc. has become dominant, as had the northern route around the Taklamakan Desert. While the main road to the Byzantine world ran through Merv and Iran, there was also an important route up the Amu Darya and north of the Caspian. Figure 2: Detail of the Central Asian part of the Silk Roads. (Background NASA imagery from Visible Earth at: http://visibleearth.nasa.gov/). 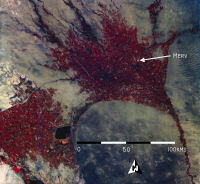 Figure 3: Landsat 7 satellite image of the Murghab Delta, showing the position of Merv. Note the relatively narrow and deep cut channel of the Murghab River flowing from the south (present day Afghanistan) and then spreading out in a fan-shaped delta to the north. (Image thanks to the Tokai University Research and Information Centre). The site lies at the southern edge of the Karakum Desert, on a broad delta of rich alluvial land, created by the Murghab River which flows northwards from Afghanistan (Figs. 2 and 3). The ancient cities of Merv developed close to the course of the main river channel in antiquity, starting in the 6th century BC and continuing until the Mongol sack of AD 1221. This was followed by a period of Mongol activity, a resurgent Timurid city of the 15th century, and expansion in the 19th century. Together the ancient walled areas alone covered more than 1,000ha (Fig. 4). Figure 4: The ancient cities of Merv. The earliest, Erk Kala, was founded c. 500 BC. Around 280 BC it became the citadel for the much larger Hellenistic city of Antiochia Marginana (today known as Gyaur Kala). 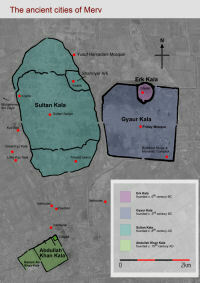 Around the 8th century AD a new Islamic city of Sultan Kala was built to the west, although Gyaur Kala continued in use alongside this, becoming an industrial suburb. In the 15th century the Timurid city of Abdullah Khan Kala was constructed to the south, to which was added a suburb, Bairam Ali Khan Kala, around the 18th century. (Background IKONOS satellite image).